**The first solid week I was verily reeling from birth high and existed in a very sweet high energy state of mania. Besides the agony of my stitches and the new bizarre inconvenience of using the bathroom, I felt fantastic! I remember barely sleeping for several nights (even when the buddy WAS sleeping) and having the thought, “This is fine! I don’t even need sleep! I’m not even tired!” even though Jonathan was crashing. It took me a long time to come back down but of course I did eventually succumb to fatigue. Sometimes I get so tired I tell Jonathan that I have a "white brain" (like a broken screen) and not to listen to me as most of the conclusions I arrive at in that state are veritably insane. **Speaking of stitches. Of course no one talks about that for obvious reasons but that's really been kind of miserable. I think I may be mutilated and ruined forever. Maybe a good reason to complete your first year of marriage before having a baby after all. I can definitely see why women get depressed--you are sapped of energy when you need more energy than you ever have before, and on top of the exhaustion your body is partially destroyed. That is tough for anyone to deal with. **I feel like I can't make a statement beginning "My baby is--" because his habits and ways change all the time. He barely cried the first week and now he typically has a few hours of being "infected with rage" in the evening when he gets exhausted and becomes indignant that he has to sleep (this is according to our best educated guess). **Nothing ever works twice. It's a fun little dance trying to figure out the right combination of sounds, songs, vibration, white noise, touch, etc will finally work the magic and let out little buddy sleep. This can be tough sometimes but I think it's so good for us to go through it together. It makes us closer, it makes us love our sweet one even more when we work hard for him. **I love how he smells and how holding him melts my heart. I would do absolutely anything for him. 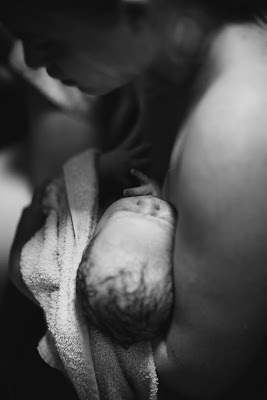 **As I remember from when my mother was having babies, one of the most fun things about having a new little one is all the nicknames and songs that are born along with the baby--you can't plan them out beforehand, they spring into being while you are rocking or nursing. I like to call Chai my "wakeful flea" (from the Napping House) whenever he is awake. I also call him Little Lion Man, the milky buddy, Chai-li, Chai-love-you, Tiny Wee Boo, and lots of other names that are even more embarrassing. We also sing to honor our wee babe. I like replacing the word "I" in songs with "Chai," (ex--"Uh-oh, Chai wants some more, uh-oh, what are you waiting for?) and Jonathan extols our baby's virtues with a variety of kindly, if repetitive, rhymes (he knows what I mean.). 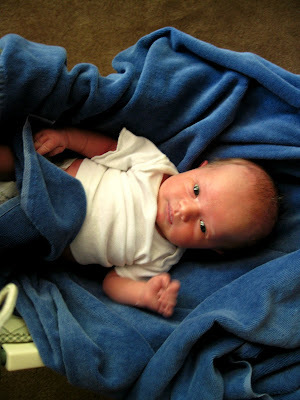 **For the first few days I kept marveling at the baby and if I looked at him long enough I would start to cry. I was so sensitive it was like I had all my skin peeled off. I still can’t believe he is real, that he is part of us, and that he wouldn’t exist if it weren’t for us. The first few days, although they felt so good, were also terribly heavy. 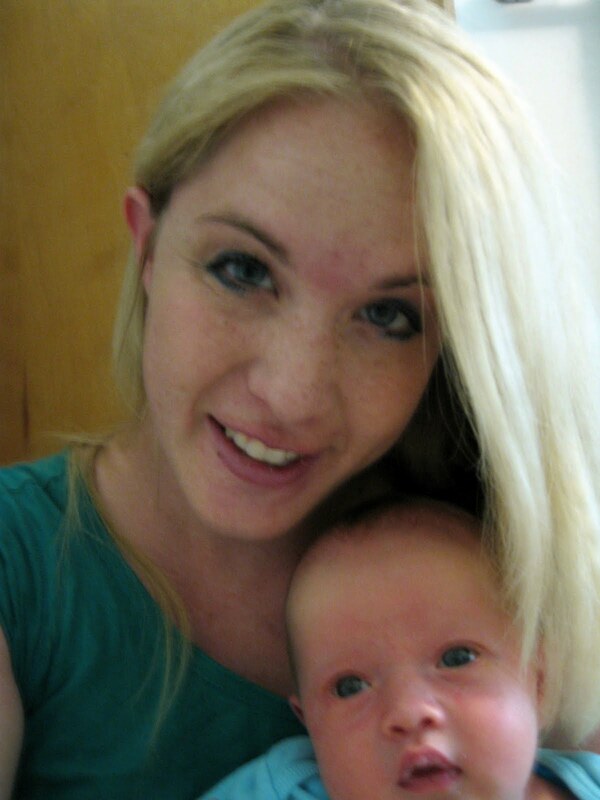 I felt a desperate love for my baby, I also felt a little afraid of him. He seemed so fragile and otherworldly. I didn’t and still don’t feel completely capacitada to take care of him. When I thought of him growing older and all that would be required of us, I felt so overwhelmed. **At around 10 PM every night (I started referring to it as the "witching hour") my mind started pelting me with thoughts of the suffering of all the children of the world. It was immense and consuming! I hurt and ached for those who are not wanted, who suffer cruelty starvation abandonment, lack of love and hideous abuse. I would think, they are out there tonight and always. I thought of all the babies I had known or read about who were injured and unloved and all the others who have endured similar pain. I wept and wept and told Jonny I wanted to collect those babies and bring them home and just hold them and cry with them. I would look at my own baby and feel so helpless, I thought about someone hurting him and his innocent pain and confusion and it hurt so much I wanted to die. I was so upset that I couldn't do anything for those babies. I pray for them. I beg God takes the edge off their wretchedness. I love them and I love my sweet son, I know I can’t protect him from everything, but I will keep him safe as much as I can and try to give him the skills he needs to be resilient when I can’t protect him anymore. **I LOVED and felt so much better better when visitors came—especially my mother—and held Chai, I could relax, it placed all these wild and powerful feelings into a normal box, I would think, lots of people have done this…I can do this…having my mother take care of him with me is such an enormous comfort. I trust her so much. She has such a lovely soft voice and mad skillz when it comes to taking care of babies. She was not able to come stay with me right after Chai was born, but she brought my little brothers and stayed for a couple of weekends and it made such a difference. It made me feel safe, like I could pretend to be a little girl for a minute longer and be taken care of. **No one appreciates their mother enough. Even though my eyes have been opened wider to my own mother's sacrifice, I know I still don't get it. I keep looking at the people around me and thinking, SOMEONE BIRTHED YOU...and that is a BIG DEAL! I'm ashamed for all the times I've rolled my eyes at my mom or sassed her or been annoyed at her. There's no way to repay all of it, it's just a gift like the Atonement you have to accept humbly and then try not to be a rotten person. But I am in awe of it all. Women are so strong, and it is so wrong when they and the world do not realize it. **My family is obsessed with Chai, and that makes me so happy. My parents argue over who gets to hold him. 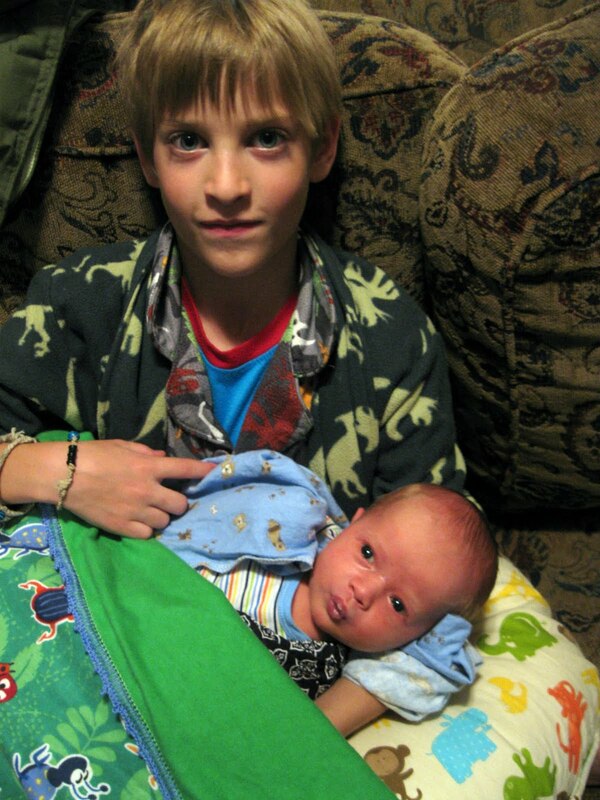 My little brother Tanner, who as the youngest never got to welcome a new baby home, loves to hold him quietly on the couch and when someone else has the baby, Tan will sidle up to them and hold the baby's hand. My sisters are so good and helpful and fascinated by him. I love how having him around generates such good feelings. He is a blessing and harbinger of peace. **One thing that surprised me is the trouble I have sleeping near my little boo because of all the noises he makes. He doesn't cry all that often; he usually wakes up about twice a night to eat, but he is a NOISY sleeper! He grunts and shuffles and snorts and whimpers out in his sleep and I cling to a fuzzy edge of consciousness, sure he is about to awaken. I've lost entire hours of sleep that way, but I'm not ready to put him in another room yet. He's too little to be all alone. **We've gotten in the habit of praising our little guy for the contents of his diapers, for burping, for spitting up, etc. We say, GOOD JOB! I bet that felt so nice for your tummy! or This is a GREAT DIAPER! Good work babe! :) I know it doesn't take conscious effort on his part, but I think it's nice to compliment him for doing what is developmentally appropriate and it's more fun to do everything when we're really positive about it. **We’ve been coping with our lifestyle change by going to bed around two or three. Everyone thinks this is insane, but for the moment it’s working for us. We watch something together and pass out, and he always wakes up twice—once around 4-5 and once around 6-7. He is great at nursing lying down which is a BLESSING! **I love feeding my little one. I heard so many horrible and grotesque stories about nursing and was prepared to be a brave solider, but so far it's working out great for us. Chai is a skillful latcher and thanks to the placenta pills I got milk within 36 hours and abundantamente. I kept waiting for it to be painful, but maybe thanks to Chai's fantastically huge lips it really hasn't been. He's so cute and dear when he nurses, and I love the sweet feelings I have for him when I get to feed him. I feel so protective and loving towards him. I'm still marveling that this is ME doing this--it was always something everyone else did, never me, never my body. It's an amazing gift! and it seems like Chai gains weight every time I feed him, perhaps I am a stealth producer of chocolate milk? I keep thinking of the line from an old book we had about the 3 Billy Goats Gruff; they declared they wanted to cross the bridge "to eat and eat and eat and grow fat." That seems to be Chai-li's mission in life as well. **My favorite thing in the world right now is having my baby sleep on my chest. It's so beautiful. 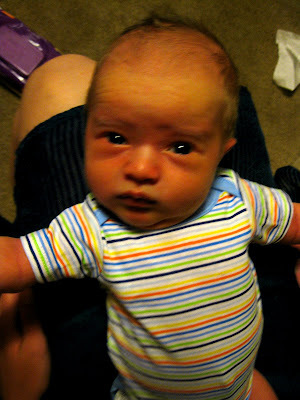 **We took Chai to the health department to do his PKU, and it was an AWFUL experience. The lady kept squeezing and squeezing his poor little foot and no blood was coming out. Chai was screaming this awful, bewildered wail and I felt like we were betraying him, and I couldn't explain to him why. Jonathan and I both had tears in our eyes. She ended up having to do the test over again in the other foot. It was ugly. I'm really glad we made the decision not to circumcise him, I can't imagine putting a baby through all that pain for purely cosmetic reasons. **I feel more faithful since my son was born. I don't claim to know the heart of God, but I feel I have the better idea of the pain and wisdom that lay inside it. We took Chai to church at our Spanish word on his first Sunday because they had just split the branch and we wanted to be there to get all the new info. I walked in so carefully holding my sleeping babe and the opening hymn was "The Spirit of God." Everyone was singing "Cantemos, gritemos" as I walked up the aisle and it touched me so much, that old flickering flame of joy, knowing and being beloved of the Savior. I had tears running down my face and it felt so good. Chai has been so good for me in this way; shifting aside my cynicism. I'm remembering all the good that has come to my life because of the gospel. **I want to have all my babies in the summer. I love looking outside at the golden glow. 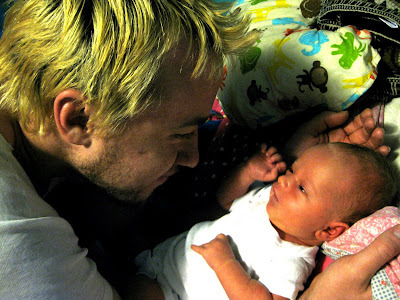 I remember the first time I emerged from the house a few days after Chai was born. I crept tentatively out the door and stood on the driveway with Jonathan holding Chai, I just felt the warmth wash over me and it made me feel so alive and deliciously happy. And when things get tough I shiver to imagine how hard it would be in the bleak midwinter. This is a good time of year to have these experiences. **I've had some rough moments. They are difficult to reconcile because I never want to feel ungrateful for having such a beautiful, healthy boy who really is pretty easy to care for. But I feel them through to the end and then they are drowned out in a swarm of goodness. Engorgement combined with pain from my stitches created some low moments. We tried to go out to dinner one night and it was a colossal failure. I was so disappointed because Jonathan had wanted to do something nice for me and I felt his disappointment stacked on top of my own. Another night I was walking around with Chai and all I wanted to do was lay down and cuddle with my husband and I thought, "I'm never going to be able to do that again," and I cried. Then I think a half hour later I was right where I wanted to be. Haha. Nothing stays too hard for too long. **Oh, how I adore my peque, and oh yes, life is different, but it is good for me, and even though I feel overwhelmed sometimes, there is a beauty about the new seriousness of this task. I’m still me and I still love making people laugh and doing all the things I did before, but what I do for Chai is better and greater. It’s a pure work although I know I can’t do it as well as I would like. **One more thing—it’s a glorious thing to have a child with someone you love. It’s letting part of them exist forever through that new person, and what a glorious ability to create something that’s half of them. I love my little boy more because he is part of Jonathan. He is so beautiful, he breaks my heart, and I'm so glad and grateful for all of this! At around 5 PM I began listening to the rainbow relaxation CD (Hypnobirthing) and I was surprised at how melty-relaxed my body became. I verily oozed onto the birth ball. I was not the most diligent at practicing the techniques during the last two weeks, but my body must have learned something, because I felt myself sink so deep into somewhere as I tried to breathe in strength from all the colors. Violet, blue, and green were the ones I liked the best so I kept rewinding the track to those mists. I felt the need for greater focus. The breathing really helped because it reminded me to relax and go limp. If my muscles were tense at all, the surge was a lot tougher to get through. I’m trying to get back inside my mind to remember how I was thinking and feeling at this time—I knew I had a lot more work ahead of me and that I was going to need a lot of strength and energy. Part of me was wondering how much more intense it was going to get, and almost wishing I hadn’t been so eager to get this started. It was here, it was real and there was no going back. Jonathan stroked my hair and told me sweet things. I remember him asking what it felt like. Cathy arrived at around the same time as Laurel, Wendy and Laura. I remember that part of the birth as a bright, happy time. I felt safe and cradled by their good cheer and reassurances. I think the intensity of the surges slowed down a little because we were giggly and laughing between them. I was so glad they were there…whenever a surge hit me I would flop over the ball or on the floor and instantly I was surrounded by a flurry of soothing words and delicate fingers. They stroked my forehead, placed firm pressure on my back right where I wanted it—how did they know?—and whispered, “Relax” and “Go deeper…totally loose, totally relaxed.” With their hands and their words it was easy to do it. They breathed with me during surges and laughed with me between them. Compared to what occurred later in the birth, I recognized that I was still very “present” during this time. Whenever I had a surge I felt just like those Russian women in the videos from class who were birthing on rocks near the sea. The women attending them were like wood nymphs or mermaids with gentle hands and flowing hair, giving the birthing women strength and keeping them peaceful. In between the surges it felt just like my bachelorette party. I remember feeling badly that Jonathan didn’t seem to have a lot to do at that time. The mood wasn’t right for him to become a wood nymph, too. Cathy checked me and I was about a two. Since it was early on and there remained a very long way to go, we decided everyone would leave us alone for awhile and come back when I was in more active labor. I was very happy about this decision; not because I didn’t want everyone there, but I liked the idea of being alone with Jonathan as I progressed and slipped into deeper intensity. 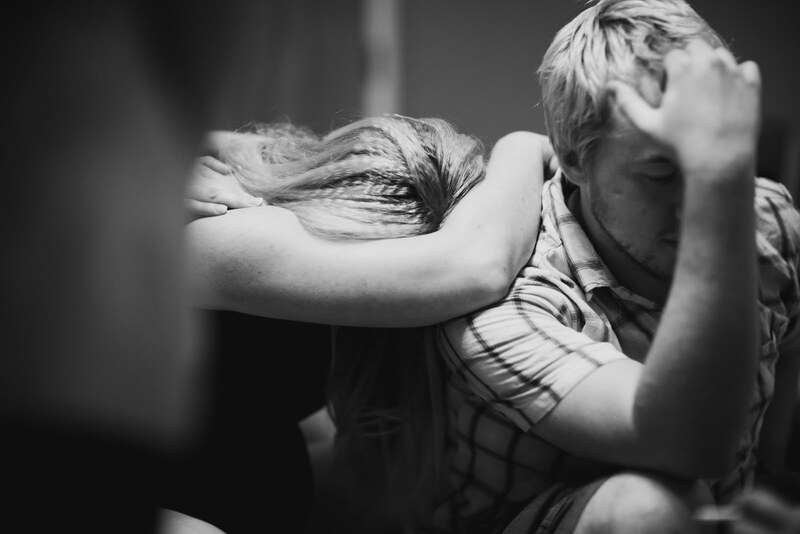 I knew this was going to require so much of me, I was still in control and managing well, but I could feel it coming closer and wanted to be able to relax with my husband. Shortly after everyone left (I think around 9 PM?) I felt the need to begin humming during surges. With my eyes closed, I imagined making vertical zigzags with the noise as I kneeled over the birth ball and moved my hips, and it helped immensely. Each surge required about three or four breaths as it built, seized me right in the middle and then mercifully ebbed away. I began to look forward so much to those ebbing away times. They felt so good and then there was always a little break before the next surge began. I told Jonny at that time that so far I thought kidney stones were worse. We were still talking a little, but my end of the conversation drifted into mumbles with closed eyes. I can’t explain how vital it had become to make noise during surges—where I’d felt inhibited before, now I felt like the humming and swaying back and forth was the only thing tying me to the earth. Vocalizing was not something I had ever practiced or expected to do, but it was so instinctive. I wasn’t worried about how I sounded, it was necessary for my survival; my body demanded it of me. It focused me and pulled me deeper. Jonathan sat with me and rubbed my back and my arms during every surge. He told me he loved me so much, that I was amazing, that I was a “birthing warrior” and once he said, “Racher, that’s a sweet noise.” I had such soft feelings for him. There was something so lovely and intimate about him holding me and being sweet to me while I was birthing our child. Evidence of our love around me with his arms and hands and kind kisses, and inside me, the child itself. Without an audience, without any fanfare, we were just together. I loved that time. It was so precious to me and I love that it wasn’t marred by rushing to leave somewhere or dealing with strangers coming in and out of our room. I can’t imagine feeling the way I felt then and having to deal with that. I will always be able to remember that during our last few hours alone together, we were calm and good to each other and not stressed out. Cathy had told us to call her at midnight and she returned at about 1 am. I don’t remember how far apart my surges were at this point because I had floated away and was locked up inside myself. That must sound spacey, but that’s really how I felt; everything around me was hazy and dim and I felt more inside my body than I ever had before. I think I was at a 4 or a 5 then, and Cathy told us that the baby was posterior. 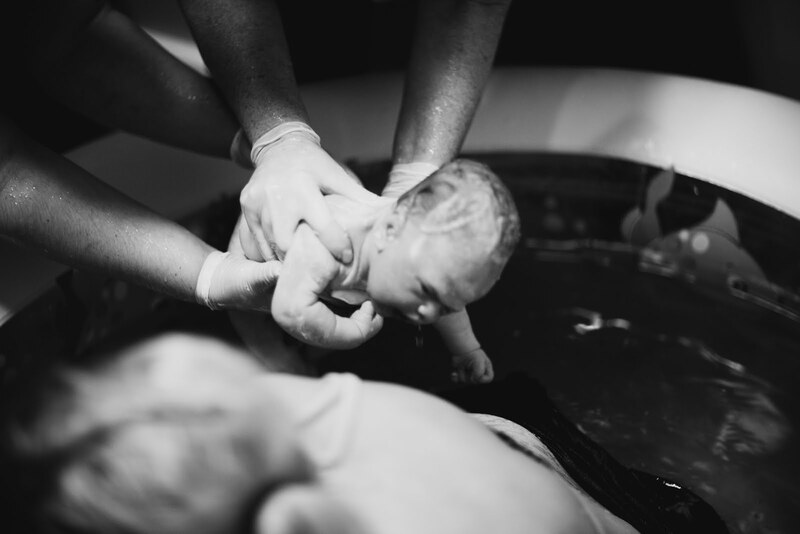 I wasn’t greatly distressed by this news because I wasn’t experiencing very much back pain, and I needed all my energy to get through the surges, but Cathy felt it was important to try to turn the baby and break the rest of the water she felt in front of his head. She had me do a series of positions that I’d never heard of before. I spent a few surges doing lunges on top of a footstool (LUNGES!) while she and Jonathan held my shaking arms. Then I sat on the birth ball and held on to Jonathan’s arms while swinging my hips from side to side and moving my legs back and forth. That position exhausted me but I gamely tried to do it as hard as I could. After that was my least favorite ever—lying on my left side with one leg stretched out behind me and the other bent. It was so hard to relax in that position, but we were eventually successful in turning the baby! You must understand, Cathy does not mess around. Wendy described it well when she said, “Cathy is such a powerful person that she doesn’t need to let anyone know how powerful she is. You just see it.” I don’t know if many care providers would have worked with me on all those different positions, or even had the knowledge to do so! I loved, loved, loved working with her because I feel that she helped me utilize my body instead of shutting it down or helping me get away from my body. That was what I wanted. Laura, Laurel, and Wendy blessedly came back while I was lying in that beloved position. I croaked a hello to them and once again there was a flurry of massaging, soft words, loving kindness. I was totally naïve about the immeasurable merits of having a doula. I was excited to have Laurel come to my birth and imagined her being sort of a cheerleader for me, encouraging me and rubbing my back. What she, Laura, and Wendy did for me was SO much more than that. 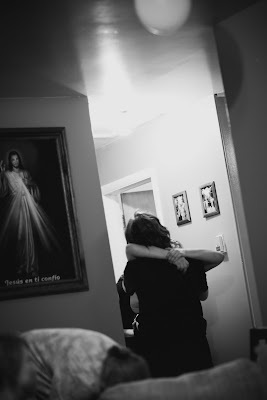 I felt like they carried me through the surges, that we were all experiencing them together. I remember thinking about how all of them had had children and gone through this before, and wanting to cry with the beauty and pain of it. It was the most potent sisterhood I’ve ever felt. Whenever I started a surge, they pressed down on my shoulders and whispered for me to go deeper, and oh I did. They stroked my hair, smoothed my forehead, pressed on my back, and did acupressure on my feet and ankles. They held up water with a bendy straw for me to drink between surges. They spoke to me with such positive energy! All of this didn’t take away the intensity of the contractions, but it dulled the sharpness of them, smoothed the tightening. Even in the moment, as zoned out as I was, I wanted to sob with gratitude. I have rarely in my life been so vulnerable and raw as I was when I was birthing, and all that kindness and goodness pouring down on me touched me so much. Around this time the humming noise I’d been making turned into what I referred to afterwards as the “whale song.” Behind my closed eyes, I started seeing a musical scale in colors. Higher notes were red, yellow, orange and pink—too bright and alarming for me then—and the low “whale” notes were calming blues, greens and grays. I realize that sounds absolutely insane, but I can’t describe it any better than that. I tried to hit those low blue and gray notes because they made me feel better. I know my mind was so suggestible during that time—Laura, Laurel and Wendy all happen to be professional singers as well as doulas (I know.) and they kept telling me, “Good! Go lower. Oh, beautiful.” Making vibrations with the lips can help dilate the cervix, and it just felt so much better to make those noises, I had to keep doing it. Having them be so affirming of the vocalizing felt so good. At times I was aware of them making the noises with me. Laura kept telling me, “You found your birth song! You are singing your baby down! He’s hearing you sing to him right now!” I remember thinking, right, and I’m probably terrifying him! I thought I was being so rough, wheezy and loud, but later when I saw the videos I realized the sound was actually very soothing and calming. Everyone told me later that they all felt dreamy and hypnotized whenever I did it. The next day I re-read a birth story where a woman was vocalizing, and the OB and the woman’s husband were both making fun of her, saying she sounded like a dying cat. When I read that I cried. I would have been so hurt and embarrassed if that had happened to me, and instead I had people telling me what I was doing was beautiful and honoring it. Everyone deserves that. At the next check I was at a 7, and had a hot-tub flood of waters bursting again. 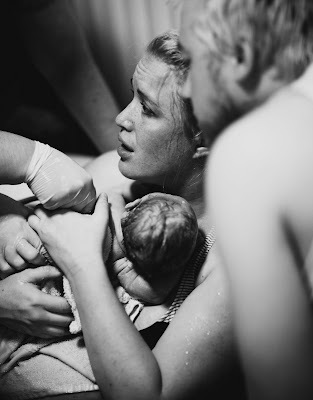 I remember starting a surge right after that check and they rolled me over on my side and pulled my legs into that position I described above--that was rough and the only time during my labor that I really cried out. I caught myself and slipped right back into the whale song, though. Someone during this time turned off the lights (Wendy?) and my midwife’s two assistants arrived, as well as Katie and Sara (creative consultants. It was so nice of them to come!). 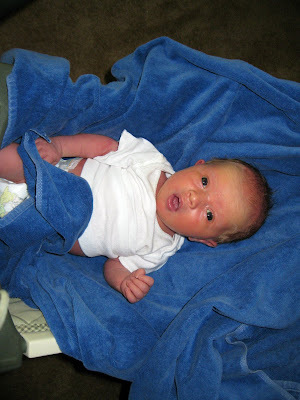 They had started filling up the birthing tub and were having trouble with the archaic plumbing in our house. I was aware of people talking in hushed voices, filling up buckets and laying down tarps. Several times I got up to go to the bathroom and the surges I had alone in there were some of the hardest to get through. I’ve read that some women feel most comfortable laboring on the toilet, but I was miserable in there. Maybe I just needed my wood nymphs, and even during active labor I was too shy to let anyone come in there with me. Once I came out of the bathroom right when I was starting a surge and felt a swelling of panic—I could not imagine dropping to the floor for the surge and standing through it seemed equally impossible. I bleated, “What do I do?” and Wendy stepped right in front of me and opened her arms and I just fell into her. She rocked with me as I moaned my way through that surge and Laurel stood behind me giving me counter pressure on my back. I heard Laura say, “That’s right, just put all your weight on Wendy.” That moment stands out so clearly against the haziness of that time and it seems so symbolic of the support and kindness they gave me that I needed so much. We passed the rest of the night this way; surging and singing and preparing the pool and house for our baby’s arrival. I had no sense of time, but some of the thoughts I was having remain clear to me. 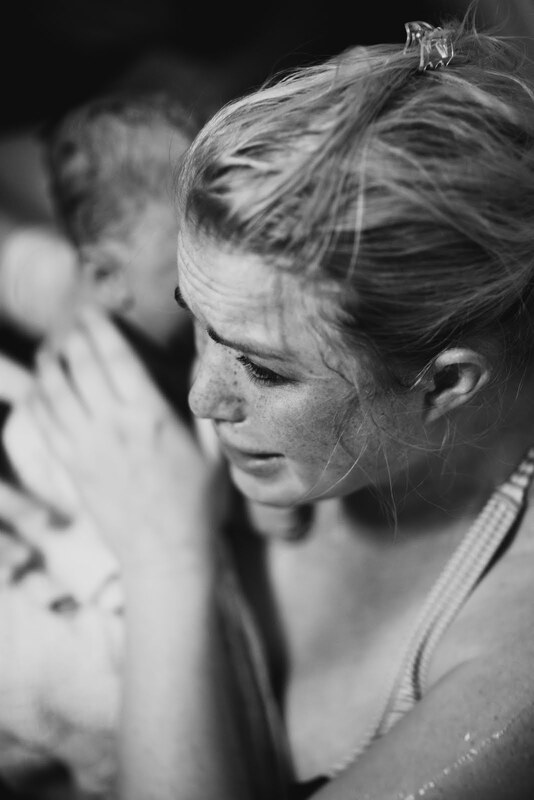 I remember thinking about my sisters/sisters in law going through labor and I felt dismayed that they might ever follow my example and would have to experience something like this. 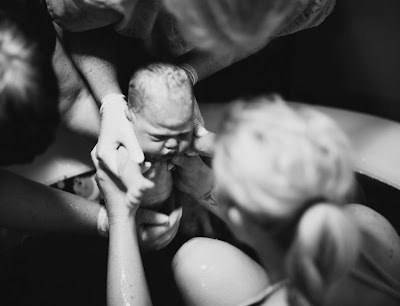 I also thought, I could never judge anyone for getting an epidural…and I really admire women who have had unmedicated births in the hospital. I think being at home was absolutely essential for me to have a natural birth. If I had been lying in a hospital bed and someone stood there brandishing a needle and explained that it could all go away right then, I don’t know that I would have been able to say no. As it was, I never felt like I wanted to leave home for pain relief, and I never asked for drugs. Even when it was the most intense, I still felt it was better to keep moving through it. After I threw up, for a few minutes I felt absolutely fantastic, almost normal. I even came back into the room and beamed brilliantly at everyone. I remember bouncing on the birthing ball and making perky statements like “This is great! I can totally do this!” and cracking jokes. Every time they laughed I felt a blissful childlike happiness. Laura told me that I had insane amounts of endorphins in my system and I said I recommended vomiting to everyone, that it was fabulous. Then I felt another surge starting and said “Here we go again!” and we were all back in our positions. The house was buzzing with energy. I sat on the birth ball and leaned into Jonathan’s shoulder while the doulas continued their merciful work. I felt a need for my husband so immense that my heart could have ripped apart, and every time I looked at him I felt like crying because I loved him so much. He was so calm and cheerful and steady. I realized later how different it all would have been if he had been anxious, fretting or even too enthusiastic. It would have impacted my own mood and focus. Just like I found my salvation through the whale song, he instinctively seemed to know the right things for him to do. He showed me tenderness without acting unduly concerned and reminded me that my body was getting it right. I should add here that my midwife’s assistants had started monitoring the baby’s heart rate every few minutes and they always withdrew exclaiming, “Baby is happy! [The heart rate]’s perfect.” This was encouraging to me, too. There were a couple of times that we all talked to the baby and told him we loved him and were so excited to see him. Awhile later Cathy told me the pool was ready if I still wanted to get in. 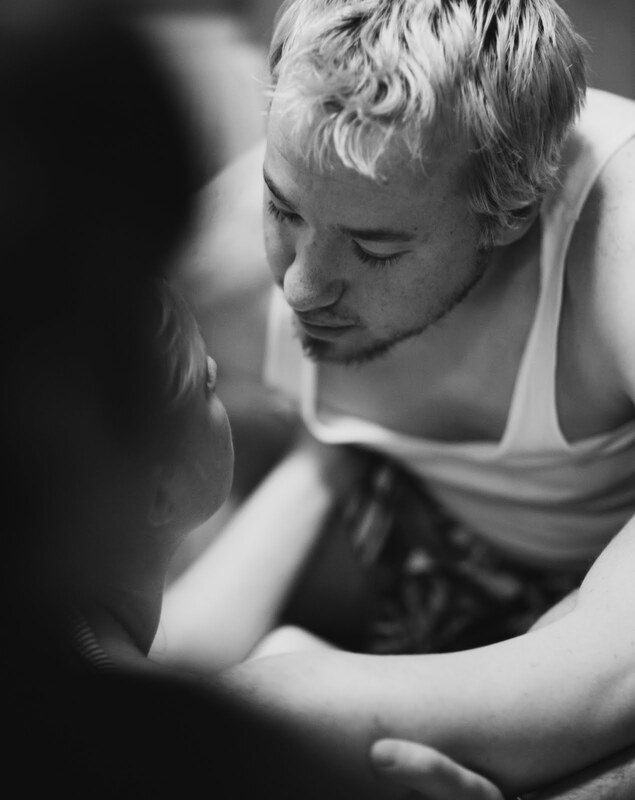 I staggered to the pool and they helped me in…I had the most surreal and vibrant of feelings. Was I really doing this, was this really happening? The water always comes in at the end of the story…I knew my baby was coming so soon, but I couldn’t concentrate on that. The water felt amazing; although at that point I was secretly hoping it would take away the surges completely for awhile, but no such luck. The heat helped, though, and the lightness I felt in the water. I kept breathing and making the whale song and everyone took turns doing the shoulder press for me (we even have a nice photo montage of that). Later I flipped around to my knees and clasped arms with Jonathan, who was kneeling at the side of the pool. Around this time, the surges started becoming impossibly long. Of course they’d been lengthening the whole night, but I was still getting at least a 30-40 second space in between to recover and pull myself together for the next one. Sometime after I got in the pool, the ebb and flow of the surges merged together so that they began coming in on top of each other. The wave would barely edge away from the peak and then instantly there was another peak. There was no steady tide anymore, it was a deluge. It was exhausting! They kept rolling in harder and stronger and I was aching for a chance to catch my breath, but I had to keep making the whale song because it was the only way I could survive. I think I started to lose it here; a little…I was drowning during those surges. It felt like each one took an hour. 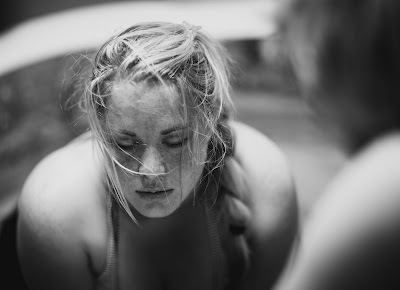 Katie told me later, “I thought, ‘her body is about to break in half!’” I was begging God in my mind to just please give me a rest, and then I could go on. I thought of praying to Heavenly Mother or some pagan goddess (Artemis?) but I couldn’t gather my thoughts together. I said out loud, desperately, “I need a break, I need a break, PLEASE Heavenly Father!” Cathy told me (speaking, perhaps, for God) that I wasn’t going to get anymore breaks, the baby was close. It was becoming more difficult to keep hitting my low notes, even with the doulas cooing next to me, because my energy was fading. The power song started to fizzle into disorganized moaning. I opened my eyes briefly and saw everyone clustered around the edges of the pool. I was floundering, starting to feel something close to despair. One of Cathy’s assistants leaned close to me and told me that I wasn’t “putting everything [I] had” into my noises anymore. She told me to try “letting it all out.” I realize that sounds extremely vague, and at no point did she or anyone else in the room ever say the word “push” to me, but somehow I gathered that was what she wanted me to do. But I didn’t understand how it could be time for that! I was expecting to feel what others described as “pushy,” where the urge to bear down is uncontrollable and the body “just takes over,” but my body wasn’t telling me to push at all. I was still just trying to hang on during the surges. I felt alone; I’d really expected my body to help me with this part. I asked Jonathan what he remembers about the next part and he said, “That’s when Rachel became feral.” I locked into an even deeper place inside myself and told myself, the only way this is ever going to end is if I push the baby out. No one is going to step in and do it for me. This is mine. At that point I lost whatever inhibitions I’d still been hanging onto. I plunged my hands into the water so I could support myself, lowered my head and as I exhaled I began making these grunting, guttural sounds (“Bowser” noises). 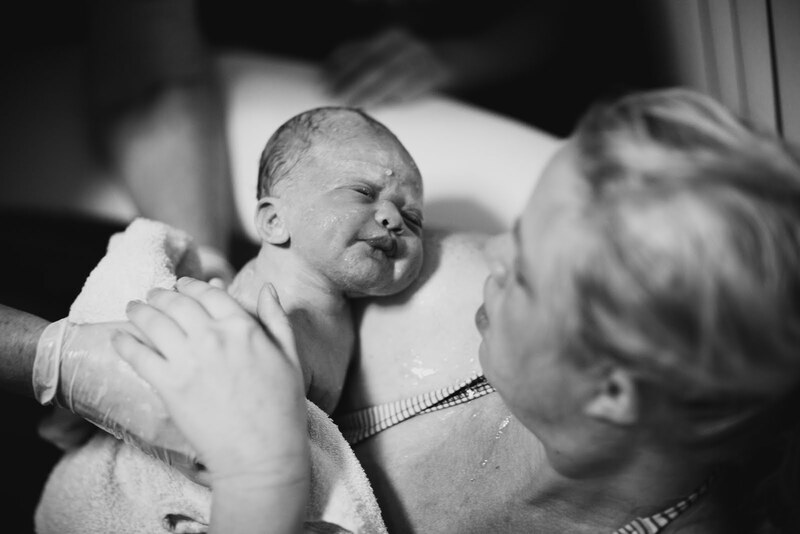 I pushed as hard as I could with the sound and I could feel the baby’s head moving into the birth canal, which was a little overwhelming. I heard Laura’s voice echoing what she’d told us in class: “Those are some big feelings…just let them be big.” I had to reach down into someplace primitive, dark and powerful to come up with those pushes--I was tearing the lining of the world. Each push was a gargantuan effort far beyond what I’d ever thought I had the capacity to do, and yet somehow I did it over and over again. I have zero memory of his body coming out; there was just this immense relief as my body stopped its restless heaving. I could hear splashing and I was already sobbing and frantic to turn around and see him. OH! My baby! He was already crying and snuffling by the time it took for me to move my legs around the cord and lean against the side of the pool. I couldn’t believe this grayish froggy body in my arms was my son, that I birthed him and it was over! We did it! He was so lovely! He was so new and sweet! I kissed him all over his vernixy head. Everyone kept exclaiming how much he looked like Jon, especially his sweet little lips—he has a huge top lip and a smaller bottom one, just like my husband. Within seconds this tidal wave of the most intense emotions smashed into me. The “cocktail of hormones” resulted in making me absolutely manic, and I was shaking and bawling, babbling a mess of lovingly blurred words. “Oh baby! You’re real! You’re alive! Are you scared? I’m so sorry, I was scared too, I’m so sorry. Oh, baby I love you, thank you for coming!” He was so floppy against my neck, I half-expected him to start talking to me. It already felt like a miracle was glowing in the room, I don’t think it would have even surprised me. I looked around at the faces of the people around me; some of them were crying. They were all shining like angels to me. I think the oxytocin made me imprint on everyone in the room…I felt like I needed to make a speech from the birthing tub, but I was totally discombobulated. “Thank you so much for being here!...you don’t understand…” What can you say to the people who have just carried you through the most significant experience of your life? Any words of appreciation would be flat and stale; but looking back, I think we all felt a lot that day and I think they do understand. Jonathan was leaning teary-eyed at my shoulder as they wrapped a towel around our little boy. I looked up at him and asked, “Do you love him?” "I love him!" he said. I think he was as dazed as I was; we couldn't believe what had just happened. Now that I was "back in the room" I wanted to process the experience with everyone, but there was more work I had to do. I was a little indignant when Cathy told me I had to birth the placenta. Obviously I knew about that beforehand, but part of me was like "Seriously? Do you know what I just did?" Haha. The placenta was birthed (it was heart shaped--#lovechild) and we tried to start breastfeeding but I think the baby and I were both too wired right then. I wanted time to look at him and get to know him, at the same time I wanted to talk to everyone in the room about what had just happened. I remembered to ask Jonathan to call my parents and let them know that their grandson was born. I was on this incredible high wave of triumph. When I stood up to walk into the living room, Laurel said, "Can you believe you're not pregnant anymore?" It was surreal...I'd just had a baby...in my kitchen, with no drugs, and he was perfect! I will admit I had a sort of smug moment of glee when I thought of all the people who hated on me and said I couldn't do it, but mostly I just felt righteous humility for the joy of having a strong and healthy baby. We sat on the couch for awhile having some skin to skin contact and tried to get him to latch on. Then Cathy's assistants cleaned and weighed him while Cathy stitched up the carnage (you don't want to know). He was 8 lbs, 4 oz, and 21 inches. I was so proud of my sweet little one! I'm not sure where to end the story...where we cut the cord, where Cathy kissed me on the forehead and told me "your birth was phenomenal," where I realized I didn't have any nursing bras, where everyone left and I passed out on the coach with the baby asleep on my chest, where I woke up freezing and Jonathan came and put his arms around both of us, where Laurel brought her whole family over a few hours later to clean our house (oh! thank you!). 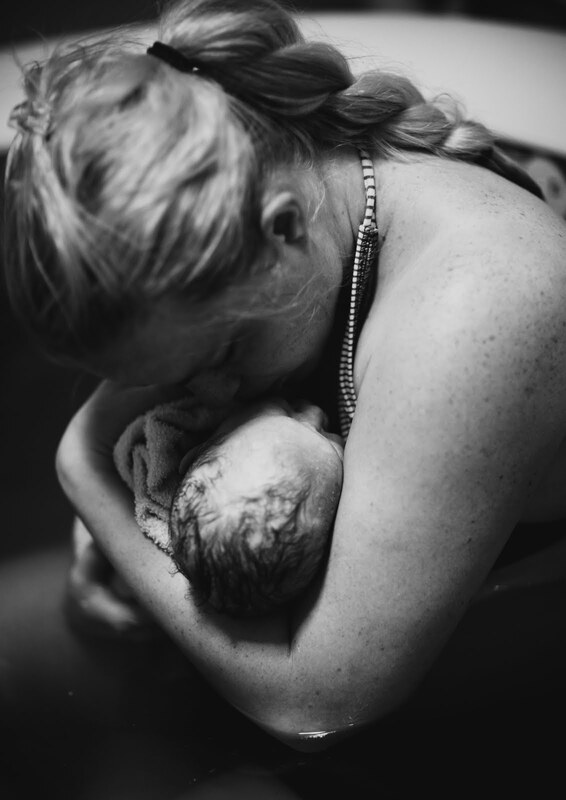 "The birth story" has kind of blended into our new life now. 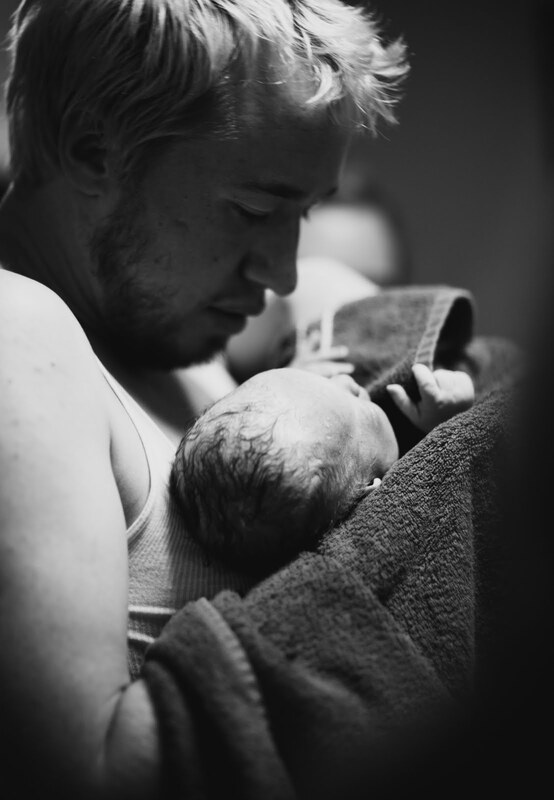 Jonathan and I both feel so changed by what happened...not just by the arrival of our little guy, but by the birth itself. 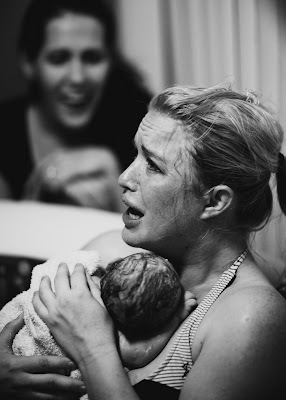 I absolutely don't think we could have had a better experience...I was privileged to have so many powerful women attend the birth, along with my husband. Everyone there had a vital work to do and they all labored along with me. 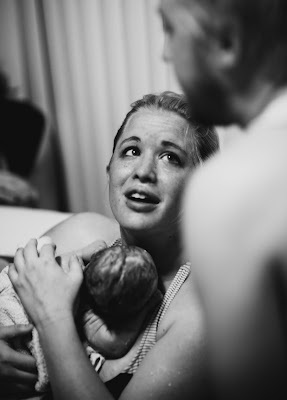 There was no one in our home that night who didn't share our vision of what we wanted our birth to be; no one brought in any negativity or fear or a “spirit of emergency.” Everyone one of my birth attendants are mothers themselves; all of them view birth as a privilege and a normal physiological process. As much as I felt dependent on my midwife and doulas, they were so respectful and focused on letting my body do what it was meant to do. Never at any time did anyone make comments about me or my body that indicated I might not be able to do this. With kind hands and soft voices they told me over and over and over again that I was doing wonderfully and that could keep going. I knew I could, but it meant so much to be buoyed up by that much support when I was in the middle of the storm. It was the epitome of empowerment. They all believed in me and I never doubted myself. 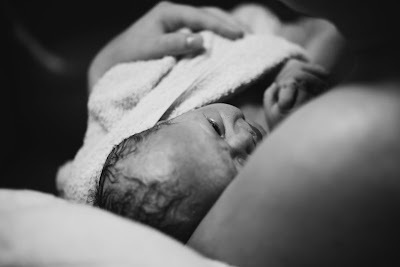 I feel like my midwife “presided” over the birth and took action when she deemed it necessary (like the positions she had me take to turn my little guy when he was posterior), but otherwise she left me do what I needed to do. She did not feel the need to speed up or micromanage my labor and birth. I felt free to take my time, move how I felt like moving. Nothing was done to my body or my son’s body that had motive in someone else’s agenda. 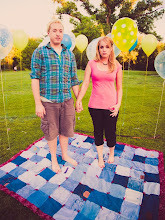 Although we received so much help, unquestionably this birth “belonged” to me, Jonathan and our son. That means so much to us! I'm so grateful for the research I did during my pregnancy and especially for my decision to use Hypnobirthing. I am so glad we took the class--not only was Laura an amazing teacher, but the information covered in the class prepared me to give birth without fear. It separates cultural perceptions and traditions about birth from what women are and have always able to do when they are given support and no one interferes with them. It reinforced everything I had intuitively felt about pregnancy and birth. It taught me to relax during labor. The techniques I learned manifested themselves in a different way than I had expected, but they worked for me and while I don’t know if I would describe my birth as “comfortable,” it was manageable and I felt confident through most of it. It was HARD—definitely the hardest physical challenge I have ever endured—but oh, how grateful I am that I went through it! I had the ineffably powerful experience of surrendering in ways I never had, finding out I was stronger than I thought I could be. It’s incredible to think of now. 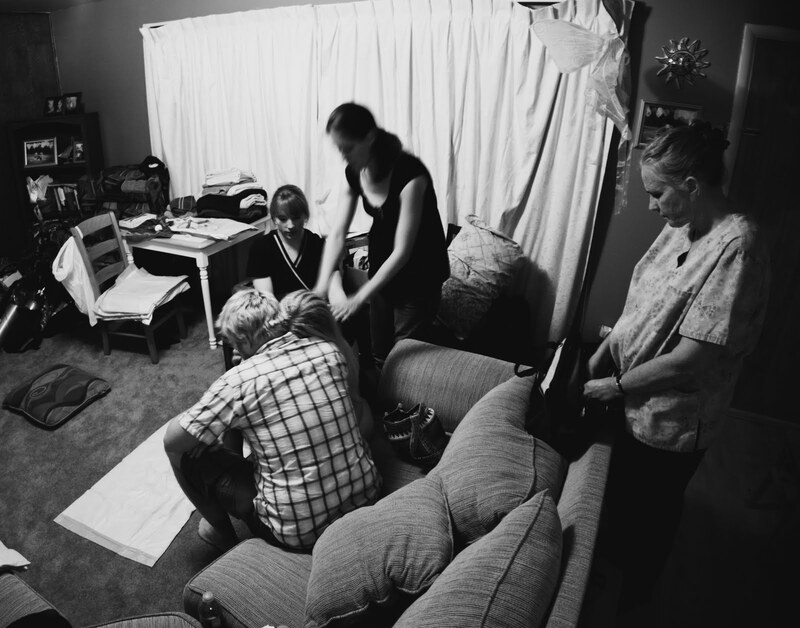 The day before I went home from my mission, my mission president told us that we were about to walk through a door and once we were on the other side, what we had done as missionaries would not seem as hard or intense, because it was over. He said we’d be nostalgic for the good things but once the burden was lifted we would never remember it the same way. I think childbirth is probably like this…so I wanted to write this story while it is still as fresh as the pain from my stitches (haha). But I do hope I can do it again someday…and again and again and again! Thank you for reading and thank you everyone who honored this day by your presence. Now I am going to go enjoy my little Chai, who is a little Stranger no more. I have the most precious 7-day old son. This has been the sweetest, deepest week of my life. 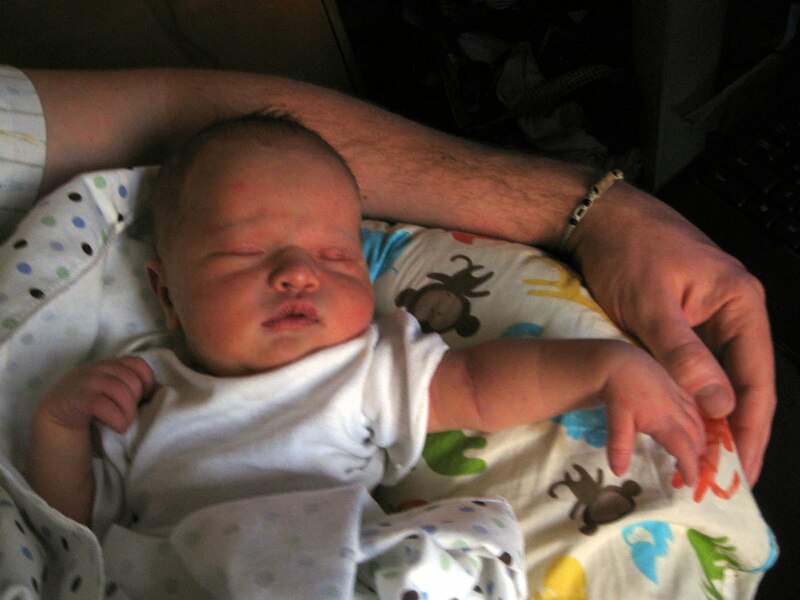 My son’s birth has been like an enormous purifier on my life. I feel stripped of my layers of cynicism, doubt, and annoyance. My heart is laid raw (the closest I remember feeling to Romania) and weeps for any pain I hear about. I have this absorbing feeling that all I am is my heart, and right now it’s all I want to be. I am reeling in the richest emotions of tenderness, gratitude, adoration, reverence. I've waited so long to be able to write this story! I have to start with this (from my journal on June 3, 2011) as a preface because it explains my state of heart and mind when my birthing experience began. Today was a heavy whipping cream emotional day for me. Yesterday I fell on the driveway (in a horribly undignified and humiliating way) and this morning I was seized with terror because I hadn’t felt the baby moving as much as usual. (Indoctrinated by Little House on the Prairie where all falls result in instant hemorrhage and a frantic rush to get Doc Baker) so I went to see my midwife again today. Before I met with her she had me do a "kick count" (you lie on your left side and write down how many times your baby moves in an hour). He didn't move at all in the first 30 minutes and I started crying hysterically, sure that he was dead. One of my thoughts was that people would blame my decision to have a homebirth, when really it was my own stupid fault for falling down the driveway! Then I had the idea to eat a power bar and drink some water, and he started moving like crazy. I was so relieved! I visited my midwife and she listened to his heartbeat and had me reenact the fall to show her how I landed and said he should be fine. My knees are bashed-in masses of scabs and still full of very small rocks, but my uterus is the shiz. I'm grateful to have a healthy body that has taken good care of our little guy and protected him from danger and jolly rancher chews. We can't wait to see his little face. He will be tremendously loved. I love him more for suffering his loss for 30 minutes today, as silly as that sounds. Laura came over tonight to do a fear release and it was glorious—I had so much energy and felt so serene afterwards. She used a script she wrote herself and I learned so much from it and had the most incredible, ready visions. 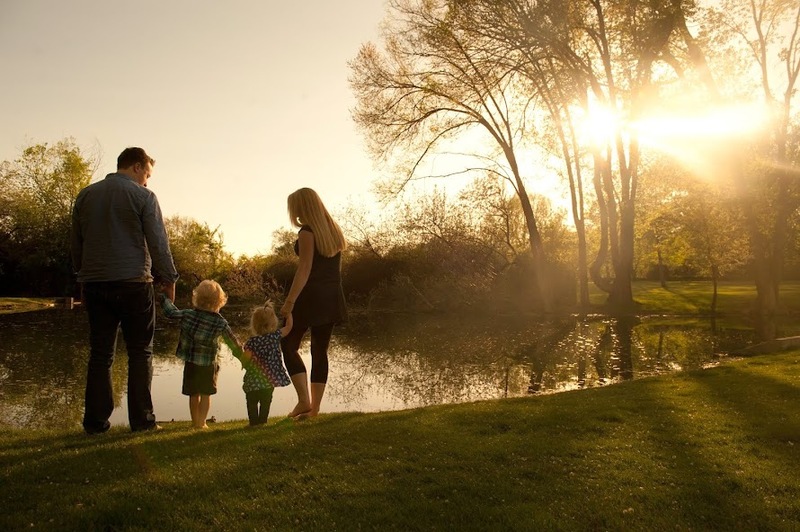 I wish church or the temple could be like that…it unlocks my mind and fills me with light and resolve. This week I’ve been complaining about my body a lot (the drive-through camera at Wells Fargo completely demoralized me, I asked Jonathan how he could even continue to live with me if I really looked like THAT) and feeling like a manatee/elephant seal/toad person. Part of the fear release script involves you looking inward and THANKING your body for the miracle of conception and carrying a healthy baby. When I opened myself to those ideas I felt so ashamed for my ugly thoughts. My body might not be as svelte and lithe as it [hopefully will be again one day] once was but it’s making a miracle possible. Also, when I think of the women who perceive their bodies as “broken” because of infertility or other problems I absolutely ache for them! I feel grateful that my body is alive and thriving and capable of giving life. It’s so beautiful, it really is! In another section, Laura talked to the baby and told him how much his parents love him and how welcome he is. She talked about his little face and his little hands and I was crying. He is more important than I can understand; he will mean everything to us! He will be the best of our lives, I know it. The loveliest of all was the warm hallway full of light, I had to imagine all my fears, doubts, and limiting ideas hung on the wall as pictures. I looked at them with detachment. I imagined portraits illustrating the scenes where people had discouraged me and treated me with disdain. I saw the colors blur and drip from the page as the pictures shrank smaller and smaller, eventually disappearing. Then I got a new canvas and painted enormous depictions of the hopes for our birth. My favorite and the most vivid was just me and Jonathan and our little Stranger sitting in the pool and adoring each other, with light streaming in from the windows, from the water, from the baby. I titled the painting “Dar la Luz” and it filled me with such joy and confidence. I hung it with a most heavy frame and Laura said “It will be.” It was such a good day to do a fear release, and made me feel so alive! Laura has a perfect voice and cadence for doing the readings. She said she thinks of it kind of like giving a blessing. That’s exactly what it feels like to me, it feels like such a strengthening gift. It’s incredible. 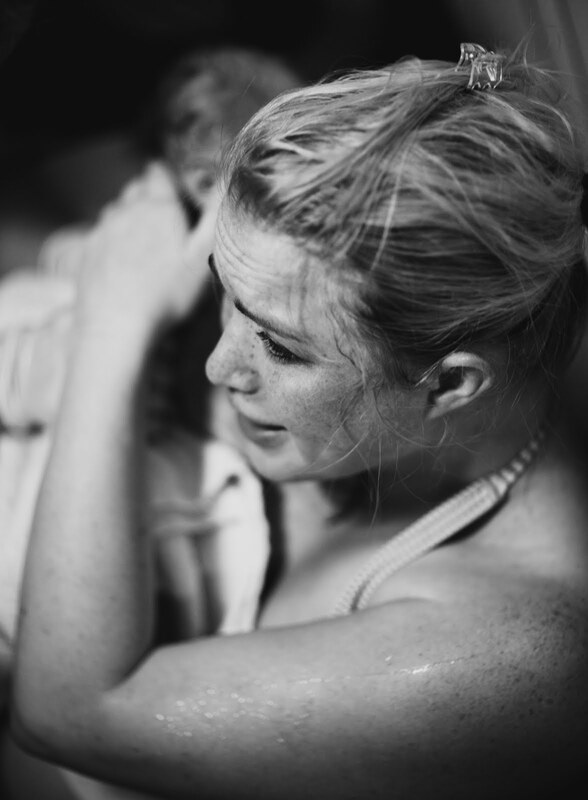 It was a spiritual readjustment and knocked me back into alignment where I want to be--in a place of respect for my body, faith in the birthing process and in my own strength, love and anticipation for my baby. I am ready for this! but I also feel a sweet peace about being pregnant for longer, if I need to be. My child is healthy and all will be well. Lightening Crashes, and a Poem I Love! 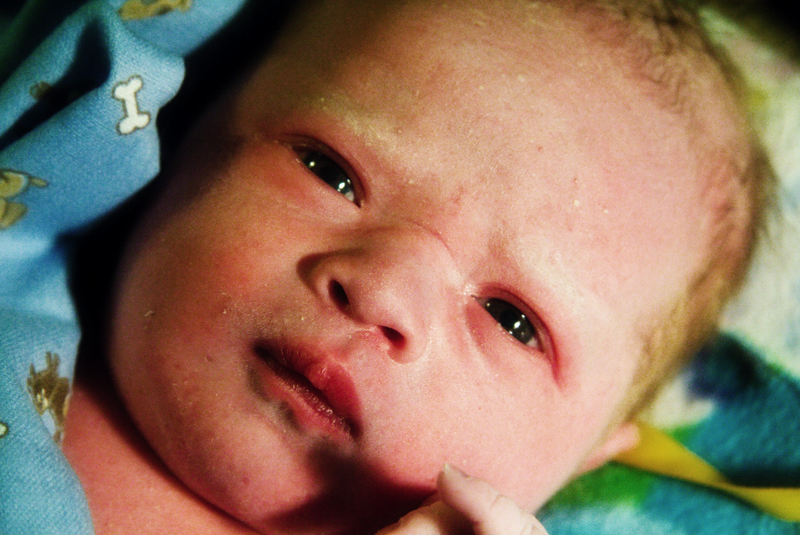 Last Monday (June 6) I called my midwife because I suspected I was leaking amniotic fluid. This concerned me a little; did it count as my water breaking? Women in the birth stories I read always described it as a gush, but this was a barely noticeable trickle. Where was my GUSH?! I was feeling no contractions besides the occasional tightness I’d felt for months. Cathy confirmed that it was amniotic fluid and told me that if I were birthing at a hospital they would want to induce me, but she wasn’t worried about it, because it seemed to be a slow, high leak and it would be so much better for me and the baby if he would get started on his own. I was a little disappointed; I was just so eager to do this and I’d had so much positive energy since doing the fear release—I wanted to put it to good use. However, as I was driving home from Cathy’s home in Payson, I sneezed! And behold, the flood! This time the gush was unmistakable; it felt like water from a hot tub suddenly pouring around my legs. I grinned and I think I even said, “Yay!” I called Cathy to let her know and she said “Great job!” and to keep her informed if I started sometime that day. I love that my water broke with a sneeze because sneezing had rendered me marginally incontintent through an embarrassing duration of my pregnancy. Haha. I came home joyously to the arms of my Jonny and informed him of my news. He was so excited; we were both so happy to know something should be happening soon. I called Laurel (my official doula) to tell her and explained that I was a little worried that I had my water broken but no contractions at all. I know it’s much better to begin with surges first and have the water break during labor. Laurel offered to come over and do some pressure points to try and get labor started. I agreed; not necessarily because I had the most faith in pressure points, but I love Laurel and wanted to hang out with her (also I will almost never object if someone wants to rub my back). She brought Zacky and Patrick over and we had a picnic lunch in my living room while we watched Pocahontas (“Savages” is my favorite part because of its overwhelming subtlety) and experimented with acupressure. A couple of times I thought I felt a tiny pang in my uterus, but maybe I imagined it. The wind was wailing outside and it was a grayish afternoon (this was around 3:30 PM) and because whenever the weather is bad (or it is night) I tend to think my house is haunted, I suddenly couldn’t bear to be alone. I called Jonny at work and asked him to please come home. I explained that I knew it could still be awhile, but I wanted to be with him for our last few hours alone. He is so steady and comforting to me always. He came home and hugged me. We were so excited to be doing this and there was a solemnity about it as well. I think we could sense that we were about to go through something powerful and difficult, and even though it wasn’t quite there yet, we were bracing ourselves.